Make room for this beefcake, the Sogarat is the pinnacle of Morat aggression. Towering over their lesser comrades, the Sogarat cuts a bloody swathe of destruction through the enemy lines. 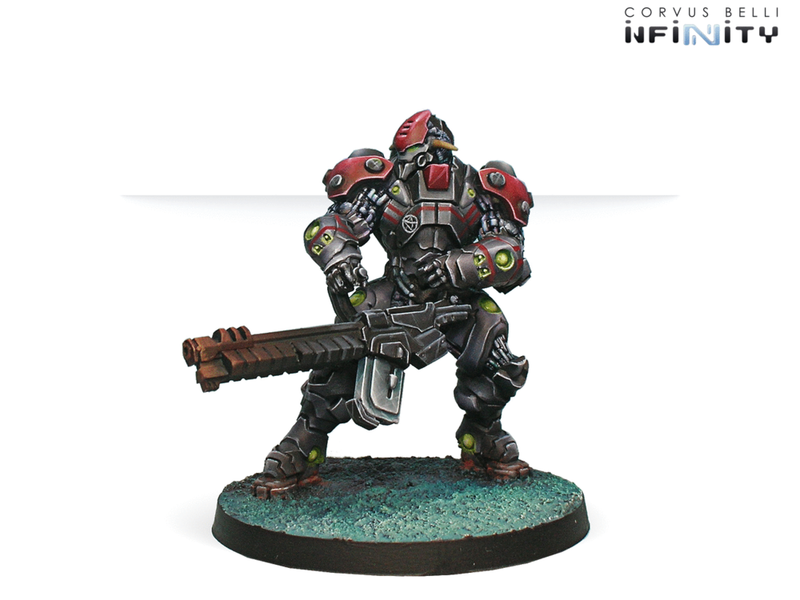 Like anything in the Morat army, they are purpose built, equipped with the tools needed to break heads, and not a whole lot more. Stat-wise, this thing is a beast. Despite it’s size it moves a solid 4-4, but that second value doesn’t matter much because you’ll be firing off it’s bug gun with BS13 at every chance. Armor 6, BTS 3, and W2 make the Sogarat really damn tough, and PH15 it’s AutoMediKit will succeed 75% of the time, not to mention it makes him good at dodging. As if it wasn’t tough enough, they recently upgraded the Sogarat to have Bioimmunity to keep those pesky Viral weapons at bay. Despite having CC20, you’re probably going to want to avoid combat, since it lacks any further close combat skills. Finally, the Morat skill is ubiquitious to the army, but extremely helpful on their Heavy Infantry. Thanks to the Veteran skill it infers, the Sogarat is much less worried about being hacked, with IMM-1 being the worst it can suffer. Religious helps a bit too, when you have this monster in cover, suppressing an area, he won’t abandon his post and hide. AP HMG. Until recently, the AP HMG was the go-to choice by just about any player wanting to put a Sogarat down on the field. High burst, high damage, and armor piercing makes this profile totally deadly in the active turn. Now that the Feuerbach profile has been buffed significantly, it takes a bit more thinking to figure out which profile is best for you. The AP HMG has higher burst, and can go into suppressive fire, which makes it a better ARO piece in suppression range. Since this profile can be your Lieutenant and the Full Auto Feuerbach cannot, if I’m looking for a Lieutenant choice, the AP HMG is my go-to choice. Feuerbach (Full Auto L2), Assault Pistol. Previously the Feuerbach was a decent choice, but often overshadowed by the burst of the AP HMG. It’s not that the Feuerbach isn’t a good choice, it’s just less flashy than the high burst option. Well, now that’s all changed! For 10 points more, you can upgrade the Feuerbach to have Full Auto L2, giving the enemy -3 at F2F rolls against their BS attacks, as well as giving +1 Burst on the active turn. This has transformed this profile into one of the most effective active-turn shooting platforms in the game, dishing out three DAM 14 AP+DA shots, plus the penalty to be shot back. There isn’t much that can withstand that kind of punishment. In the reactive turn, you can fire an EXP round, still only at B1, but the -3 penalty your opponent is shooting you at will make a big difference. On top of how amazing Full Auto makes the Feuerbach, it makes the Assault Pistol that much better. Within 16” when you’ve fallen out of the Feuerbach range bonuses, a B5 assault pistol can cause some real damage. The only real downside to this profile (besides the cost) is that it cannot go into suppressive fire, and it cannot be your Lieutenant. Obviously, if you’re looking into a Sogarat, you’re looking for a beat stick. The combination of Veteran and AutoMediKit means they need very little outside support, really only deal with Adhesive and E/M ammo, or to have better odds of coming back from Unconscious (though 75% with the AutoMediKit is pretty damn good). The Full Auto Feuerbach is a profile which I now really consider in my vanilla Combined lists. It is mathematically one of the best active turn shooting pieces in the game, which is plenty reason to slap one down on the table. In cover these beasts are ARM9, if you outrage your target you’ll be firing 3 shots on 13’s (assuming they have cover) and they’re going to be shooting back at -9, with little chance to even dent your armor. If you want to be totally nuts, why not take max AVA of them for a spin? Is this an awesome idea, or an AWESOME idea?